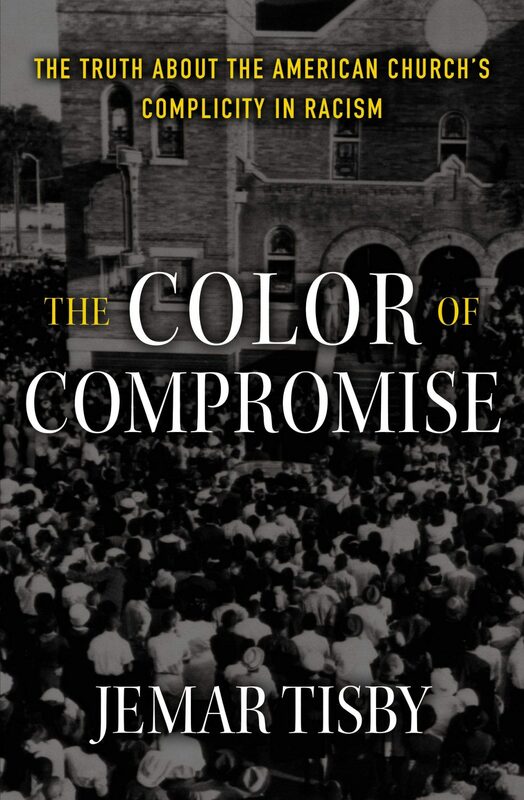 Jemar Tisby’s The Color of Compromise: The Truth about the American Church’s Complicity in Racism is a provocative and painful call to repentance for white evangelical Christians who have ignored their participation in racial injustice. Through an overview of 400 years of American church history, Tisby—who has graduate training in both American history and Reformed Christian theology and is president of The Witness, a black Christian collective—demonstrates that white American Protestants in both the North and South repeatedly used their theology and church institutions to perpetuate racial power imbalances in the name of Christ. From Jonathan Edwards’s slaveholding to Billy Graham’s support for President Richard Nixon’s racially charged policy of “law and order,” participation in racial oppression has tainted the legacies of many of the most gifted preachers and theologians in the white evangelical church, Tisby argues. He also claims that “Christian complicity with racism remains [in the present], even as it has taken on subtler forms” (190). If few white Christians today would repeat 19th-century Southern Presbyterian theologian Robert Lewis Dabney’s defenses of race-based slavery or mid-20th-century Dallas Baptist pastor W. A. Criswell’s advocacy of segregation, white evangelicals have nevertheless largely failed to speak out against contemporary racial injustice in the mass incarceration of young black men and police violence against blacks. “Racism never goes away,” Tisby declares; “it adapts” (190). Students of church history are aware of pro-slavery theology in the 19th century and Southern white evangelicals’ complicity with segregation in the 20th, but some might wonder whether racism has been as pervasive in white evangelicalism as Tisby assumes. What about the white evangelical antislavery advocates of the late 18th and early 19th centuries, they might ask. What about Billy Graham’s insistence on racially integrated crusades even in the early 1950s, when segregation was the law in the South, and his invitation to Martin Luther King Jr. to lead a prayer at his 1957 New York City crusade? Has the sin of racism been so pervasive among white evangelicals that it requires collective repentance, as Tisby claims, or was it merely an anomaly? Tisby acknowledges these counter-examples, but he presents 200 pages of historical evidence to show that, contrary to what many white evangelicals may think, it was the anti-racists, not the racists, who were the exceptions in white evangelical history. “All too often, Christians name a few individuals who stood against the racism of their day and claim them as heroes,” he writes. “They fail to recognize how rarely believers made public and persistent commitments to racial equality against the culture of their churches and denominations. Jumping ahead to the victories means skipping the hard but necessary work of examining what went wrong with race and the church” (10–11). Why has the white evangelical church supported racial injustice? Tisby argues that white evangelicals have separated the spiritual equality of all believers (which they have always advocated for) from social, economic, and political equality (which they’ve often opposed or disregarded). As he explains, the white evangelical church has frequently cloaked defenses of racial injustice in pious-sounding proclamations of the spiritual equality of all people, regardless of race. Even the most enthusiastic evangelical defenders of race-based slavery in the early 19th century advocated evangelism among slaves. Even the most ardent Christian segregationists of the early 20th century believed in the necessity of black churches, because they wanted blacks to hear and believe the Bible. But none of these groups had any intention of sharing power with blacks, either in the church or society. Even today, white Christians are reluctant to relinquish their power and race-based advantages, Tisby writes. White-run seminaries give little space in the curriculum to black theologians, and white Christian voters overwhelmingly cast their ballots for politicians whose policies exacerbate the racial divide. Even though blacks collectively have only 3 percent of the nation’s wealth, and the black unemployment rate is consistently nearly twice as high as the unemployment rate for whites, many white evangelical Christians are more concerned about “reverse discrimination” against whites than about structural racism against blacks. “In the United States, power runs along color lines, and white people have the most influence,” Tisby states (6). But rather than address this imbalance, “when faced with the choice between racism and equality, the American church has tended to practice a complicit Christianity instead of a courageous Christianity. . . . Most white Christians can be described as complicit in racism” (6). Zondervan (2019). 256 pp. $21.99. As Mark Noll and other historians have demonstrated, American white evangelicalism has been both a force for racial egalitarianism and an excuse for racial oppression. On the one hand, the evangelical revivals of the 18th century were partly responsible for introducing African Americans to Christianity en masse and creating the black church. Similarly, 19th-century revivalists’ insistence that conversion should produce a changed life led some Northern evangelicals to campaign against slavery on the grounds that African Americans were their brothers and sisters, and it was therefore wrong to enslave them. But the First and Second Great Awakenings also created Southern evangelicalism, which almost immediately distanced itself from antislavery activism. While believing in blacks’ spiritual equality with whites, white Southern evangelicals rejected the idea that their equality as brothers and sisters in Christ should lead to any change in the slave laws, the racial balance of power in society, or even race relations in the church. After the Civil War, white Southern Christians defended segregation (including segregation of churches) with some of the same biblical passages they had used to defend slavery. In the 20th century, Christianity Today cautiously endorsed some civil-rights legislation, but sharply criticized Martin Luther King Jr. for his tactic of civil disobedience. White evangelicals of the late 1960s and 1970s not only gave secondary priority to the issue of racial justice but also, in the name of higher priorities, made political choices that arguably exacerbated racial injustice. Their enthusiastic calls for “law and order” led to mass incarceration that devastated large sections of the black community, with the number of African American men in prison increasing from 143,000 in 1980 to 791,600 in 2000. And when white Christians formulated visions for racial reconciliation, they often did so without engaging black Christian theology or the black church. Some evangelical organizations have already issued confessions of past complicity with racism. The Southern Baptist Convention has passed resolutions repudiating its historic denominational support for slavery and its use of the “curse of Ham” as justification for racial discrimination. The Presbyterian Church in America issued a statement of repentance in 2016 listing several acts of racism commonly associated with Presbyterian congregations in the past, including racial segregation of churches, the false claim that interracial marriage was wrong, and the “failure to live out the gospel imperative that ‘love does no wrong to a neighbor’ (Romans 13:10).” Tisby believes that such confession and repentance need to go further and involve individual white Christians and local churches, as well as denominations. In Tisby’s view, white racism in both the past and also the present isn’t primarily an attitude of hate but an action of refusing to share power with blacks. Repentance from racism therefore means taking concrete action to give up power. White Christians should read about black history and theology, and they should work with blacks to launch seminaries that make racial equality, social justice, and black theology central parts of the curriculum, he argues. They should use their wealth to lessen the racial divide by contributing to college scholarships for black Americans and debt relief for black families. Instead of merely celebrating racial integration in their churches, they should see friendships with black Christians as only the first step toward genuine power-sharing. Most of these steps—listening to Christians of another race, learning about history and theology, and using personal wealth to help individuals in need—are so obviously biblical that it’s hard to imagine how any Christian could object to them. But Tisby also makes a more controversial claim: He argues that white conservative politics and white evangelical theology are currently exacerbating the racial divide. He is correct, I think, but in embracing this message, it’s important to state two convictions clearly: (1) The sin of equating God’s cause with one particular political partisan agenda (as some Christian right activists have done) shouldn’t be replaced with equating God’s cause with a different party; and (2) Though white evangelicals sometimes used their theology as an excuse for racial injustice, the problem was usually incorrect application of theology—not an intrinsic problem with evangelical or Reformed theology itself. In fact, both American evangelical theology and traditional Reformed doctrine include tools for addressing social injustice and repenting of complicity in societal sins. Repenting of complicity in racial injustice may be difficult, because it’s far easier to believe that we’re victims of religious persecution than to admit that our own churches—and we ourselves, as white evangelical Christians—have perpetuated wrongs toward others. If we follow our sinful inclinations, we will likely seek ways to evade Tisby’s charge that we’re guilty of abusing power. But as followers of a Savior who gave up his heavenly power to take up a cross (Phil. 2:1–8), we’ve been given the grace to resist these sinful inclinations and seek reconciliation, even at the cost of personal discomfort or our own perceived interests. If we’re truly interested in loving our brothers and sisters as blood-bought members of Christ’s family, we will listen to their critiques and acknowledge when we need to repent. Racial reconciliation, Tisby argues, won’t occur without confession of sin and repentance from white Christians—a repentance that some Reformed churches have already started to model, but which hasn’t yet occurred en masse. With God’s grace, it can occur. For those seeking a better understanding of what this confession and repentance might entail, Tisby’s book offers a helpful guide. Daniel K. Williams is a professor of history at the University of West Georgia and the author of God’s Own Party: The Making of the Christian Right (Oxford University Press, 2010) and Defenders of the Unborn: The Pro-Life Movement before Roe v. Wade (Oxford University Press, 2016).